Dallas Mobile Glass has been the preferred provider of mobile windshield replacement in Dallas for nearly a decade because of our superior customer service and convenient on site, mobile service. We all know, a severely broken windshield leaves your car unusable until it’s fixed. Then what? Do you have it towed to an auto glass shop? At what cost? Who can afford to leave their vehicle at an auto body shop for days on end until the glass is fixed.? We answer all theses question easily with “mobile windshield replacement.” Dallas Mobile Glass also offers quick windshield replacement with same-day service for over 80% of our customers. Call (214) 382-9105 to get the highest quality windshield replacement solutions available in the Dallas Metroplex. Check out some of our recent reviews from REAL customers just like you! At Dallas Mobile Glass, we employ only the best skilled and qualified technicians to work on your car. We train them on all makes and models of cars so that they can provide effective solutions to different auto glass and windshield replacement needs of customers irrespective of the car brand they drive. Some vehicles require specialized care when it comes to auto glass replacement or auto glass repair. Leaving your car in the hands of an inexperienced serviceman may prove very costly for you. Our trained technicians know exactly how to address these special needs and what parts to use in such situations. That is why Dallas Mobile Glass service is the best you can get for your vehicle. 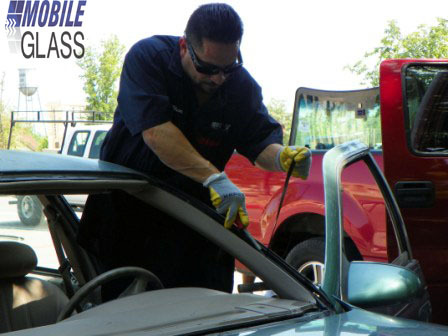 Dallas Mobile Glass technicians use the most modern repair techniques and employ the latest tools in all auto glass service. For example, we inject industry-best adhesives in damaged areas to repair cracks in your windshield. Such state-of-the-art tools and techniques also let us complete the repair or replacement task quickly so your car is ready to drive in the shortest possible time. Dallas Mobile Glass technicians come right to your home or office to carry out mobile windshield repair or mobile auto glass replacement anywhere in Dallas, Texas. All you have to do is call us and we’ll send over a skilled technician within the day. The cost of your Dallas Mobile Glass doorstep service is the same as competitors charge when you deal with the hassle of leaving your car at their service center for repairs or replacement. Dallas Mobile Glass saves you time, money and hassle. With so many advantages, it is no surprise that Dallas Mobile Glass is the preferred service provider for most Dallas locals. Opt for a Dallas Mobile Glass auto glass service today and allow our excellent service to convert you into a loyal customer too.